Esteban Gutierrez raced for the Sauber F1 Team from 2013-2014 and has been a test driver for Ferrari in 2015. The worst kept secret in Formula One is now official. At a press conference in Mexico City on Friday night, it was announced that 24-year-old Esteban Gutierrez would team with Romain Grosjean at the Haas F1 Team in 2016. The American-based F1 team will be making its debut in Formula One next season and, with Ferrari power and two drivers who have combined 118 Grand Prix experience, there is a lot of promise for the 11th team in the field. Gene Haas, founder and chairman of the Haas F1 Team, and Guenther Steiner, team principal, were both on hand at the announcement in Gutierrez’ home country as Formula One gears up for Sunday’s Mexican Grand Prix at the Autodromo Hermanos Rodriguez. “I got to know Esteban through our relationship with Ferrari, and after looking at the success he’s had to earn his role there, it became clear he was an excellent choice for our race team,” Haas said in a press release from the team. “He’s young and hungry, but not inexperienced. His two years running a full F1 schedule has given him some very good race experience, and having spent this season at Ferrari as their third driver allowed him to see firsthand the methodology that makes Ferrari such a power in Formula One. 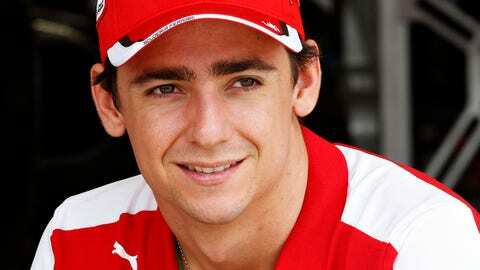 Gutierrez has spent 2015 as a test and reserve driver for the Ferrari F1 team after being dropped by Sauber at the end of 2014. He scored six points in his only points finish to date with a seventh at the 2013 Japanese Grand Prix.